Epson introduced the R1800 (A3 version of the R800) around 3 years ago. The main reason for me buying it (I had a 1290 at the time) was the print life and the better colour neutral B&W prints by not having the light Cyan and Magenta which then needed to be matched with the corresponding dark Cyan and Magenta (even using ICC profiles this was often a struggle). The R1800 solved this, and with Gutenprint support was a winner for me. I conducted trials of loads of different types of papers and had profiles made for many of them. My findings where that many third party papers (even the major brands) simply where not up to the job. This was particularly the case with the matte type papers (chalky rather than plasticy coatings) where they simply did not manage to hold the same ink density if it was put down to fast. Printing at the highest resolutions (more passes for the same amount of ink) was often needed to stop ink bleeding on the paper. The only matte paper that I was satisfied with without using high resolutions for dense prints was Epson's own. The glossy / pearl (plasticy coatings) papers all handled the ink density well, but there was a distinct difference in colour. Many of the highly reviewed third party papers turned out to be less neutral and had a blue-white (often perceived as a whiter-than-white) colour. This makes me think of tricks used by some TV manufacturers where they found that by boosting the blue slightly in their sets, they stood out in the showrooms and sold more. Could this be the same trick? Epson photo papers are very expensive, especially for the highest weights, and while the print quality is excellent, I think they have competition for these types of paper. My eventual choice of photo paper is very reasonably priced and available in both plain Glossy and Pearl (rather like what others call Lustre): Ilford Galarie Smooth. Both the Glossy and Pearl give very similar colour rendering, so one profile is likely to be ok for both unless you are fussy about perfect colour. 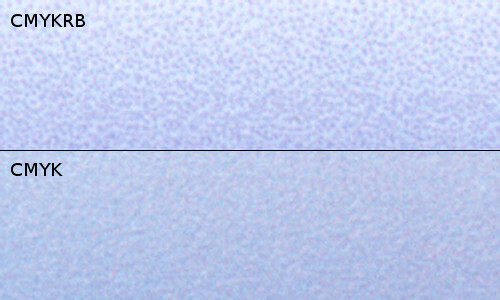 As can be clearly seen on this test strip, the blue area is uneven and the density dips briefly as we move towards magenta. This is likely what is causing the artefacts seen above. I suspect that Epson intended this printer to operate in CMYK mode in the more neutral area, and only use auxiliary colours at higher densities to extend the gamut. Gutenprint seems to have chosen to use them as primary colours (ie. even at low densities) which results in very visible dot patterns in lighter blue and to some extent red areas. Having spent years messing around trying to get good colour in both prints and monitors, I have given up and done what everyone else who wants good colour does: colour management. Colour management is highly effective at getting consistent colour across different devices (cameras, scanners, monitors, printers, projectors etc. ), but does require care and a degree of understanding to use it correctly. This is often where things go wrong - people don't take the time to learn how to set it up right, they don't verify their setup against a known good colour reference, and they don't maintain the setup. The results is that many people have had bad experience with colour management and dismiss it outright. As I colour manage everything, the printer setup is based around using colour management. Enhanced Gloss: Your choice. I use it for anything that goes on display. Various versions of Gutenprint are subtly different in their colour rendering, so if you are not using exactly the same version then you may find that your colour is a bit out. Also, printers vary from one to another, and I can sometimes also pick out slight differences when one cartridge is nearly empty and the others are all full. Also, keep in mind that with the widespread use of CFL lighting these days, you simply don't get a smooth illumination spectrum (CFLs often give a very peaky spectrum) with indoor lighting and this interacts with inks resulting in metameric failure and different colour being seen under different lighting conditions as a result. Generally I print from Gimp and simply converting the image to this profile (Perceptual without Blackpoint Compensation or Relative with Blackpoint Compensation depending on what you are trying to achieve) and print the image with the above settings. You may want to duplicate the image before doing this so that the original is preserved in the working colour space. This profile was created using Argyll which in my experience walks all over expensive commercial systems when it comes to giving results that look most true to the original. This has particularly been the case with printing at extremes of gamut where the commercially made profiles shifted colours, but Argyll managed to render the colours much more true to the original. These where produced simply by converting the original image to the profile (Perceptual) and then back to sRGB. 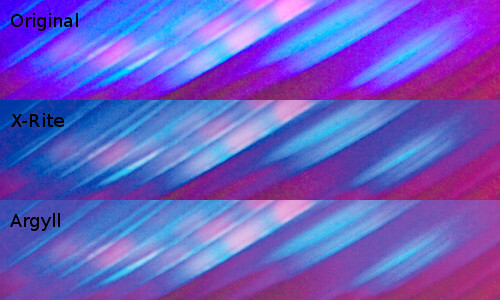 As is clear (especially in the top left), is that the out of gamut blue/magenta regions simply get completely converted to blue by X-Rite, but Argyll keeps the colour true, but just limits the saturation to the printer gamut. I am the project lead for Gutenprint. I read (what I presume to be, since there's no email address) your blog entry "R1800 Gutenprint tricks" with no small amount of interest. I have some comments on this and perhaps we may want to discuss this further. First, a brief explanation of the DeviceN ink generation and color conversion performed by Gutenprint. Gutenprint does the color conversion in HSL space (or really HL+K -- hue, luminosity, and black level). This normally produces smoother gradients than typical RGB or CMYK profiles. The DeviceN ink generation is done in a variety of ways. 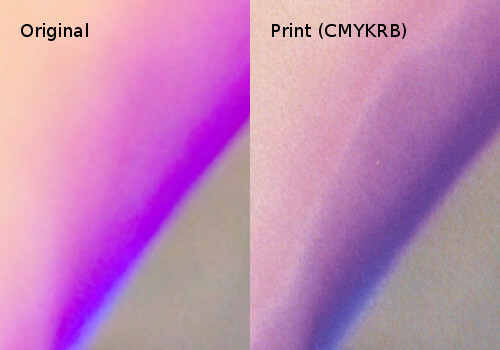 For typical light inks (CcMmYK, for example), we do CMYK separation with parameterized GCR and then split the channels based on the channel level and amount of ink. For the odd printer like the R800/R1800 and R1900, the method is different -- we do the conversion based on HL (i. e. we only look at the non-gray portion of the color). Unfortunately, this results in some odd effects in the region where the colors kick in. I've observed the same kind of thing you have but have not been able to resolve the issue. I suspect that you're right that the intention is that the red and "blue" (which is really purple) inks are intended to be used only in dark, highly saturated regions. Unfortunately, I have not been able to devise an algorithm that does this without having other undesirable effects. The CMYKRO in the R1900 is even stranger -- why is there an orange ink between the already non-primary red and the primary yellow? My assumption is that it is intended to help with skin tones. Your approach of using 4-color standard (CMYK) may be best for most people. I've observed that the primaries in this printer produce very weak reds, though, but perhaps profiling it would yield better results. I suspect the only way to use the RB inks would be with a carefully constructed DeviceN profile. on the R2400 and R2880, they actually produce smoother output, even at 1440x720 DPI. I'd like to improve the output on the R800 family for the next major release of Gutenprint (we're trying to hold colors stable in the 5.2 series, and have better testing procedures to ensure that). But I'm reluctant to make stabs in the dark that might simply result in worse problems. If you want to include this in a blog entry, please feel free to. I have also acquired a automatic spectrophotometer and am hoping to start offering custom printer profiles. Initial tests have given superb results (far better than my profile here). I am also hoping to be able to offer a "Open Source" profiling service (probably under Creative Commons) in coming months, but more about that another time. what a relief! somebody did that for me! thanks a lot for that analysis and gutenprint settings! Where / how do you put in the printer profile? I'm totally psyched to have found this, after owning a R1800 since they first came out. I'm not sure yet how to make use of your icm, but I'll work on it this weekend. Thanks Glen! This ought to be awesome! I've tried out the icm, but the colors are off by quite a bit. Too many variables for to troubleshoot it myself, alone. The ICM is more a proof of concept: each printer needs individual profiling for accurate colour, and I find ink levels even affects things. Also, without exactly the same settings/ink/paper etc. it won't work at all. For colour management to work, everything needs to be colour managed. When you say "colors are of by quite a bit"..... compared to what? An un-profiled monitor? Are you viewing in D50 light? If you are comparing to a monitor... emissive sources vs reflective never work well, but good monitors are D65 devices, and others as high as D93 (many Laptops). I've got two identical model monitors, but way different colour - see other article. The starting point has to be everything fully colour managed, then this should get you in the right ball-park with exactly the same settings/ink/paper, and your Gutenprint is rendering colour for the R1800 the same way as when I wrote the article. ... 1hr before sunset. This time around, I had to play with the printer settings in Win7 to get a decent image, but succeeded since there are far fewer parameters. So this time around, maybe my aged inks/paper have caught up to me. Gotta go. More later. I'd be interested in any more feedback you care to offer.